Microsoft has released a new tool called as Microsoft .NET Framework Repair Tool that will help you resolve issues you may face with the .NET Framework on your Windows computer. 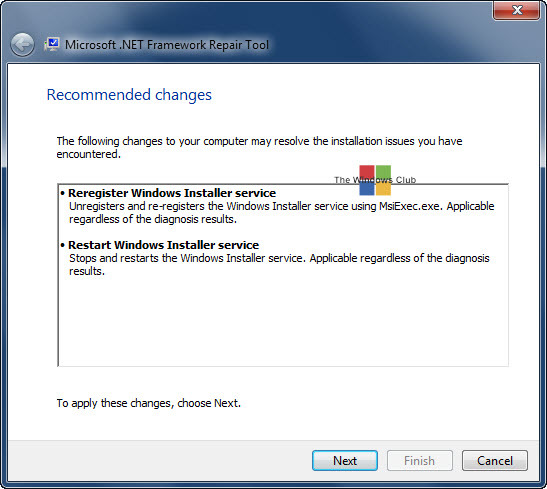 This tool troubleshoots common issues with the setup of or with updates to Microsoft .NET Framework setup installation. Additionally, this tool tries to resolve these issues by applying known fixes or by repairing the installed product. 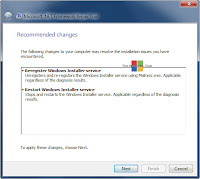 · Re-register Windows Installer service. It unregisters and re-registers the Windows Installer service using MsiExec.exe. Applicable regardless of the diagnosis results. · Restart Windows Installer service. It stops and restarts the Windows Installer service. Applicable regardless of the diagnosis results. If any additional fixes need to be applied, those too will be recommended on completion of the run. While one may need to troubleshoot .NET Frameworks 4.0 Install Issues on Windows manually, or run the .NET Framework Setup Cleanup Utility and try to install the .NET Framework again, running the new .NET Framework Repair Tool from Microsoft should now be the first option, should you be facing any .NET Framework issues on your Windows computer. Download page: Microsoft .NET Framework Repair Tool.